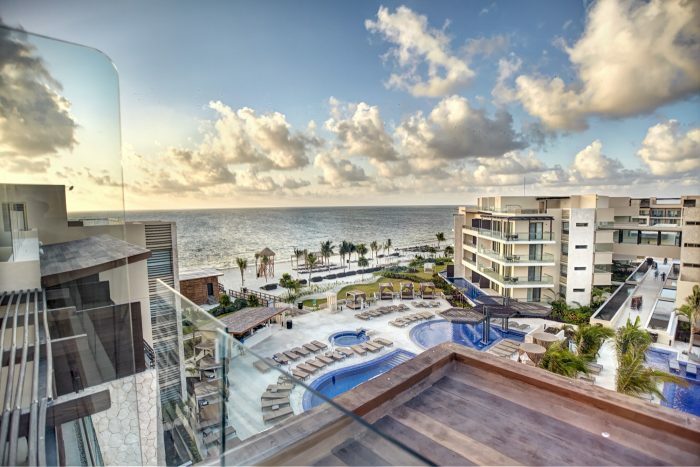 The Royalton Riviera Cancun offers a sprawling complex with bountiful pools and serene ocean views, sure to delight any wedding guest. 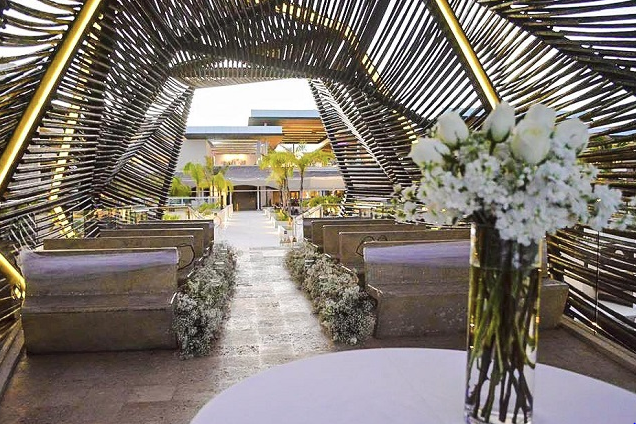 With Caribbean decor designed to impress and thoughtful service for the duration of your stay, you and your guests will be relaxed and ready for your destination wedding. For an unique group activity, have the adults in your wedding party participate in the daily afternoon tequila tasting. 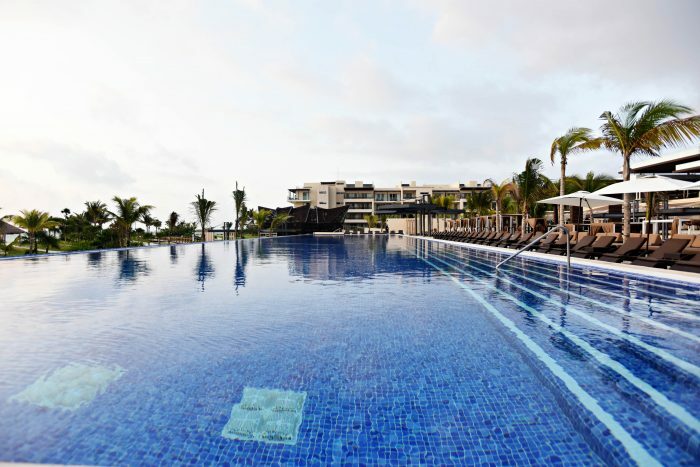 The property is anchored by its pool complex, with 11 different pools for your wedding guests to enjoy. 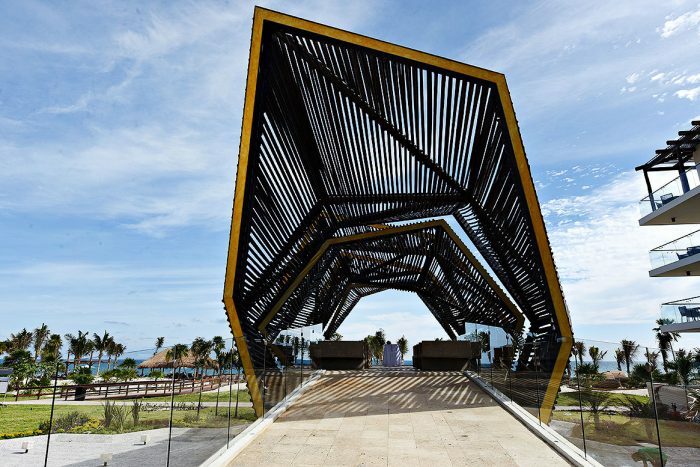 With 6 wedding venues, including the unique Sky gazebo with elevated views and an adults-only option, there are ample locations for a beautiful ceremony. The free package welcomes up to 10 wedding guests based on a minimum booking of 5 rooms for a 7 night stay. Upgraded packages, additional guests, and add-ons are available for an additional cost. Main Beach – 300 guests max, Gazebo Playa 1 or 2 – 100 guests max, Sky Gazebo – 90 guests max, Chapel – 60 guests max. On average 5 weddings occur per day spread across the venues on-site accordingly. $150 – $270 average price based on per person per night. Rooms include indoor jacuzzi and rain showers and exclusively designed DreamBed brand mattresses. Diamond Club upgrade costs approximately $50 per person per night, which includes exclusive beach area and pool. Children 2 and younger are free. 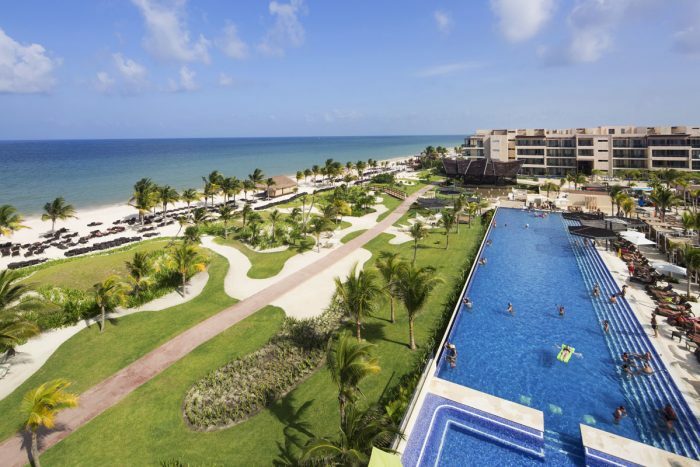 There are 840 rooms with resort, walk-out pool, or ocean views. 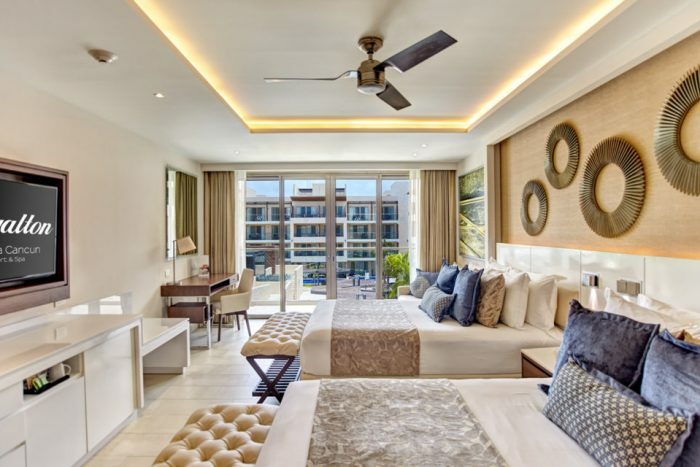 The resort is split between an all-ages section and The Hideaway at Royalton Riviera Cancun, an adults-only section with private pools, beaches, bars, and rooms. The resort is recommended for more active guests due to the large size of the property. The Luxury Wedding package becomes free for up to 10 wedding guests based on a minimum booking of 35 room nights. Upgraded packages, additional guests, and add-ons are available for an additional cost. 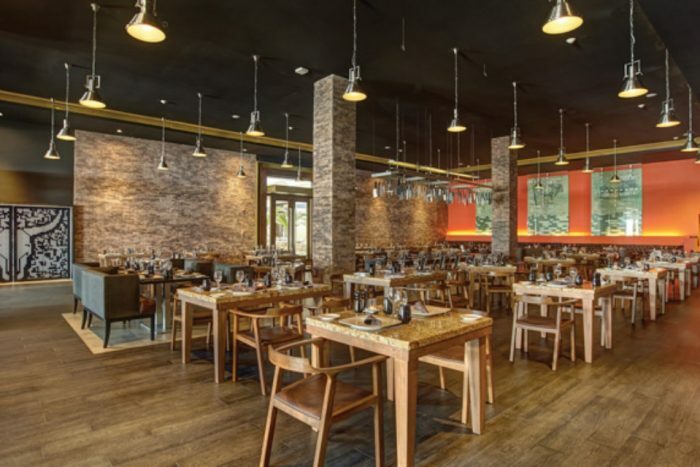 A: 1.5 years, approximately 300 across the resort brand. 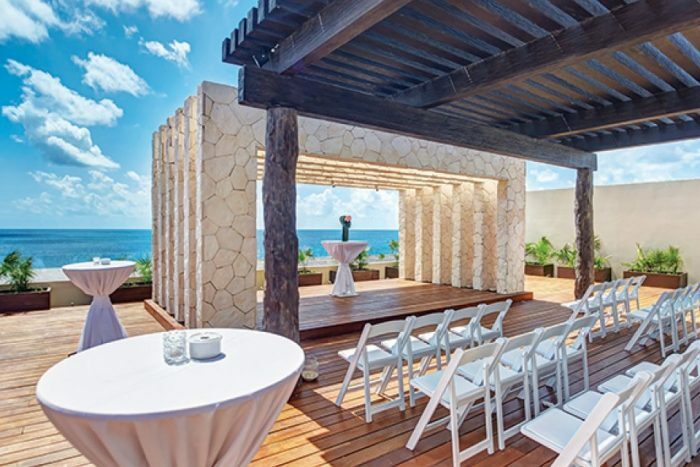 A: Since the Royalton Riviera Cancun is quite a large property, we have a wide variety of incredible ceremony and reception venues! 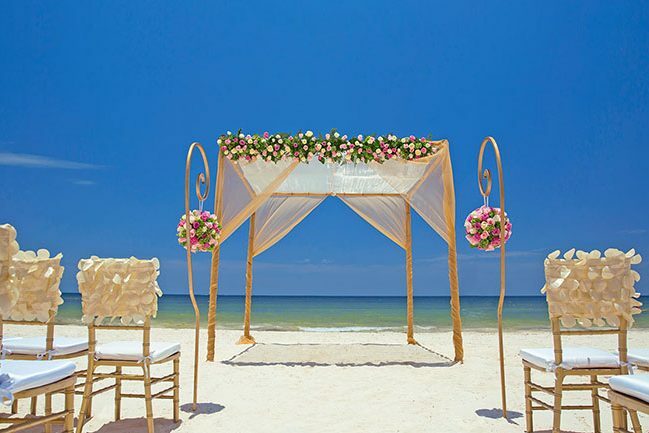 We have the classic beach wedding, as well as our stunning chapel location, which are both complementary venues. We also have our amazing Sky Terraces (both a family friendly location and a separate adults-only location) which can be booked for an additional fee. The Sky Terrace is a completely private location and has panoramic ocean views – it’s truly breathtaking! 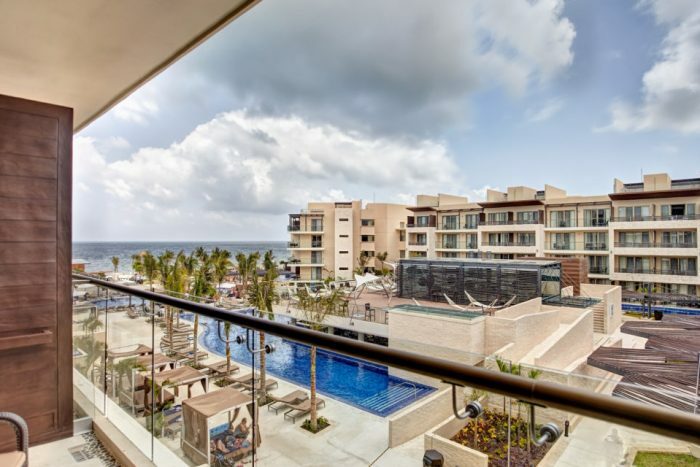 On top of the wedding locations, the Royalton Riviera Cancun has won awards for its modern design elements and is a luxury property that is sure to impress your wedding guests. A: As I mentioned above, we have a lot of spectacular wedding locations, but the Sky Terrace is a clear favorite and it does get booked up quite quickly. Especially during our high season from May – July. We always advise to book more than a year in advance if you are set on the Sky Terrace! A: Friendly and accommodating staff, incredible food and variety of cuisine, fantastic amenities, and professional wedding team. A: There’s something truly romantic and magical about destination weddings and getting married by the ocean with your closest family and friends. Destination weddings really do bring all of the most important people in your lives together, and allows them to not only celebrate a wedding, but also enjoy a once in a lifetime vacation! A: I had a bride whose mom was not going to be able to make it to the wedding, because her brother recently had a medical emergency and needed her to stay home. The bride was upset, but understood that her mom needed to be at home taking care of her brother. I received a phone call from the bride’s mom about three days before the wedding, letting me know that she had arranged to fly to the destination to be at her daughter’s wedding, even if only for the day. She wasn’t going to miss her daughter walking down the aisle! I had to arrange a last minute transfer and update the wedding plans to accommodate. All of this was a surprise for the bride, and I was so happy to be a part of a moment that I know they will never forget.